The Cleansed is produced from Fred Greenhalgh’s off grid recording studioÂ nestled in the woods of the small town of Alfred, Maine. 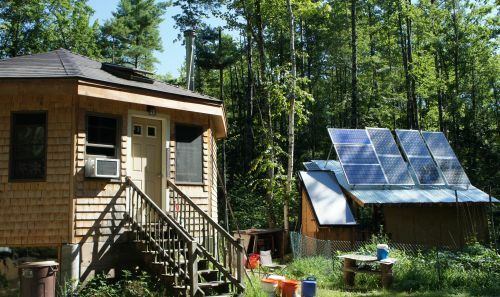 So yes, we’ve done our best to make sure everything we include about solar panels, homesteading, farming, and surviving when the grid goes down is reasonably accurate (I mean, this still is fiction after all). His 550 sq. ft octagonal home, dubbed the “YAWFT,” is loosely modeled on a yurt with the exception of being built from super-insulated SIPs panels. Â A 1kw solar electric system provides more than enough juice for editing and mixing audio on a ProTools DAW system with Mbox and RÃ˜DEÂ Procaster. Fred and his family recently started the build-out of an additional freestanding structure for bedrooms and maybe, just maybe. a ‘real’ sound studio. When he’s not writing or producing radio plays, you can often find him in the garden, milking a goat, or hanging out with wife Amy and daughtersÂ Nyana and Chandwen (and porcupine attacking mad-dog Henry). In addition to just really being psyched about living a sustainable lifestyle while doing what he loves, Fred also works as the online marketer for leadingÂ Maine/New Hampshire solar installer, ReVision Energy. A low-impact, buy local, sustainable living and art philosophy is at the heart and soul of our productions.